New UN HABITAT office in Cairo : will it join with activists and stand up against forced evictions? The Daily News Egypt is reporting today that UN-HABITAT is opening a regional office in Cairo on October 3rd, World Habitat Day. This screen capture from Cairo 2050 (source GOPP) calls for turning Manshiyet Nasser into a "Touristic Housing Developmet" without demonstrating a coherent strategy for rehousing those displaced. Will the next version of Cairo 2050, to be released next month, offer a more inclusive vision for the city? How can UN HABITAT join with Egyptian activists, architects and planners to work toward a more economically, socially and environmentally sustainable city? According to the article, the new office will be responsible for coordinating programs in the region and may facilitate greater collaboration between the Arab League and the UN HABITAT program. “Cities and Climate Change” is UN HABITAT’s theme for World Habitat Day 2011. As the article states, climate change is major force facing Cairo and many other cities around the world. Some of the poorest residents of cities such as Cairo live in neighborhoods that are highly vulnerable to climate-related impacts. UN HABITAT’s work in Egypt has, in general, been exemplary. See for example the report released earlier this year entitled, “Cairo a City in Transition” (link on our news and trending tab). UN HABITAT, however, also provided technical expertise in the development of Cairo 2050 (download Cairo 2050 and read a longer critique of the initiative on our Cairo 2050 tab). Two of the projects outlined in Cairo 2050 such as the Corniche redevelopment, running through Bulaq, or turning Mansheyet Nasser into “Touristic Housing Resort” could displace hundreds of thousands of hard working residents who have lived there for generations and play a significant role in sustaining Cairo’s economy. The Cairo 2050 document does not propose a coherent alternative to the large-scale displacement and forced eviction of many of the city’s working class residents that would be caused by the projects it proposes. Bulaq now and future? 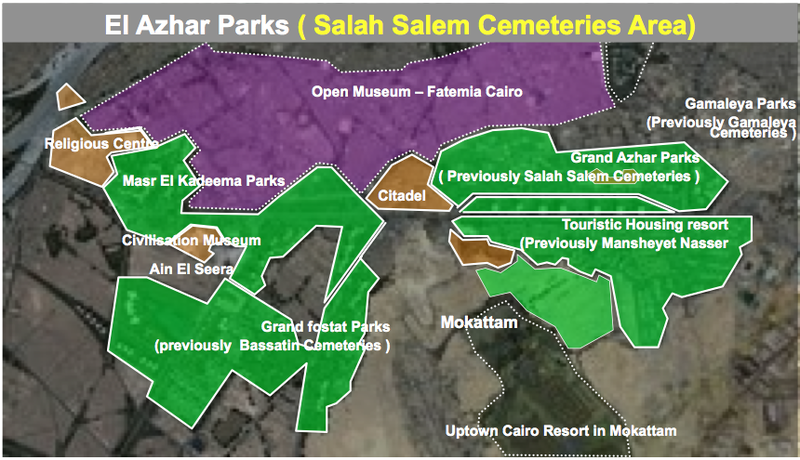 This slide from Cairo 2050 (source: GOPP) shows the Bulaq area transformed into a vast campus of high-end development. Where will these residents go? How will residents and businesses from other areas be able to use the many vital services and industries presently found in the Bulaq if this neighborhood of tens of thousands of families and businesses is transformed into a campus of skyscrapers? The satellite cities Cairo 2050 proposes are more of a pandora’s box than a panacea. Developing them would have many significant negative impacts, including worsening the city’s transportation challenges and economic segregation. With a new version of Cairo 2050 widely rumored to be released next month, it will be even more important to ensure plans offer a model of inclusive development that does not forcibly evict residents. UN HABITAT should continue to be a leader of social justice in urban development. It should endeavor to make common cause with the dedicated and skilled Egyptian planners, architects and activists who reject forced evictions and support an urban development strategy for Cairo in line with UN HABITAT’s stated goals of upgrading and improving neighborhoods for the betterment of all the city’s residents. Mexico City will host the global World Habitat Day conference on Cities and Climate Change on October 3rd. The full report is available online for download. Amnesty International released a report on forced evictions in Cairo in August. it became the aim of animosity as it represented an opposition to that political freedom. killed in Dara’a on Wednesday, with many more injured.